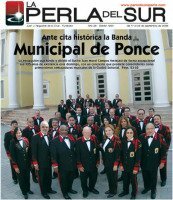 The origins of the emblematic Ponce Municipal Band go back to September 1883 when the illustrious Juan Morel Campos established its famed precursor, La Banda del Benemérito Cuerpo de Bomberos or Ponce Firemen’s Band. Since then, the famed and distinct ensemble has been consistently backed by a magnificent group of virtuoso performers, an excellent sound quality and a wide-ranging repertoire. It was in 1953 that the original venture was dissolved and officially reorganized as the Ponce Municipal Band. Eduardo Cuevas, Domingo Cruz (Cocolía), Eustaquio Pujals,Tomás Clavell, Julio Alvarado and his son Emilio, Luis Osvaldo Pino, Jorge Figueroa and lately Rubén Colón Tarrats are among the memorable cluster of brilliant directors that have faithfully maintained its well deserved fame and reputation. Many generations of outstanding Ponce musicians have been humbly forged out of this prestigious undertaking. Just to name a few: Ríos Ovalle, Rito Morel (Morel Campos’ brother), Cosme Tizol, Calixto Net, Tomás Mislán, Polito Usera and the Jamican prodigy John Batist, who admirably played the snare drums with only three fingers in his right hand and two in his left one. The Ponce Municipal Band is particularly known for its Madrid and Cádiz reminiscent Retretas. These open-air concerts are customarily played on Sundays at the City’s main squares affirming our rich musical tradition and cultural heritage. The 42 member icon of a band has pompously performed in several international venues, including some unforgettable presentations in New York’s Puerto Rican Day Parade and in Washington D.C. 4th of July celebration. A planned 2009 European tour to commemorate its 125th anniversary was eventually scrapped due to the global economic crisis. Three recordings, including a CD-DVD proudly portray the best of their collection of popular as well as classical melodic performances.